Much has been written elsewhere on the why's and wherefore's of planning issues concerning sheds in woods. For example, there is a very informative article elsewhere on this website and there are discussion threads in the forum section of the SWOG [Small Woodland Owners Group] website. 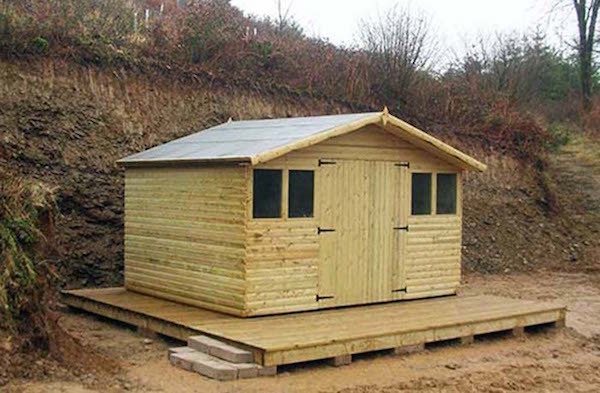 This article concentrates on practical considerations when choosing, siting and constructing your shed together with ideas and tips based on my own experience of building all sorts of structures for woodland owners. 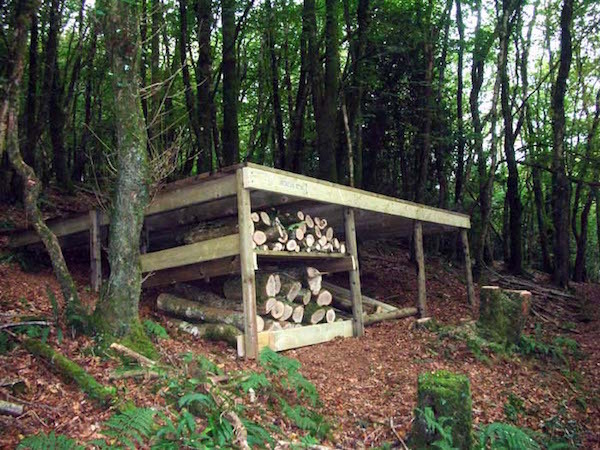 woodland owners decide they need a shed/store for a whole range of reasons. These can be anything from the most basic need to have somewhere to securely store their tools, through to wanting a fully-functional forestry store and shelter – somewhere to take a break from working in the woodland, a place to dry out work clothes and carry out maintenance on tools, and ‘base-camp’ for working weekends & holidays with family and friends. what you choose should be based on its’ intended use. If all you need is a tool store for hand tools, then there are many metal or plastic ‘strong-boxes’ available and these have the advantage that they can be located just about anywhere and are easy to conceal if security is an issue. If you have larger machinery to store such as a ride-on, mini tractor or similar, then perhaps a half-shipping container [but see below for considerations of getting it into your preferred spot in the woodland]. If you want a more conventional shed then your choices are basically buy in a ‘ready-made’ shed [preferably from a local wood-yard rather than a multi-national DIY chain] or design and build your own using bought-in materials or even timber from your own woodland. 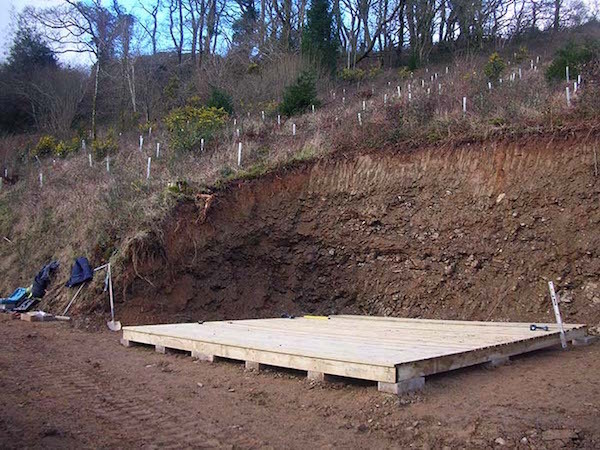 this is where the 'law of sod' becomes fully operable, for it is almost certain that your ideal location, the spot where you imagine sitting outside your shed, cold drink in hand at the end of a hard days’ work, watching the sun set over your woodland will be the least accessible place in the whole wood! So, compromises may need to be made. 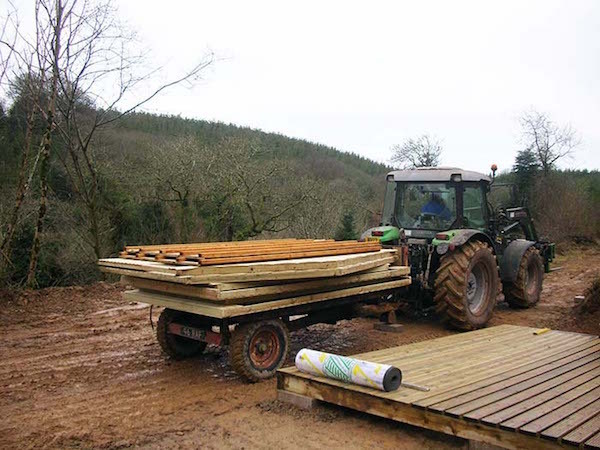 Think about how you are going to get the ‘flat-pack’ shed or raw materials to the intended location and, get a clear answer from the supplier regarding where they will and won’t go when delivering – few want to venture off the public road. 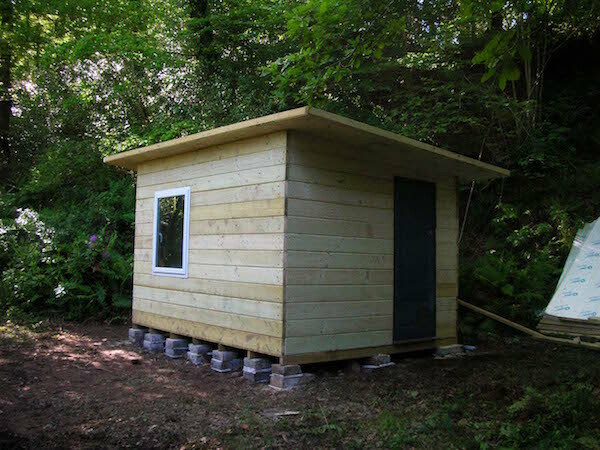 Also on delivery, get a firm commitment on date & time; not one of my jobs, but I know of one woodland owner who turned up first thing on a Friday to take delivery of the shed of his dreams, to find it sat on the roadside verge, where it had been off-loaded two days earlier. Luckily, this was a very honest area and everything was still there. Finally if your chosen location is on a slope, then all is not lost. Use the slope to your advantage and build a sound horizontal platform to take the shed and use the space underneath as a log store. Construction: the secret of shed success is a sound base; once you have a solid, level base and all the materials nearby then construction is the easy bit (gale force winds excepted). Typically for a 12 x 10 shed sat of a larger base, my work colleague and I would allow 3 days: one day for getting everything on-site, one day to construct the base and a third day for erecting the shed. More elaborate structures may take longer to put together. If you are unable to complete the job in one go, aim to break the work down into units like this ie transporting materials to site, then building the base, then putting the structure up. once your shed is up and weather-tight, you can think about extras like guttering & butts for water collection, solar panels for either direct lighting or charging a ‘leisure battery’ or two, a small woodburner, a nearby [but not too nearby] composting loo, mesh around the base to keep rodents at bay. As with many projects, us chaps have a tendency to ‘over-engineer’ things, so keep your intended use for the shed in mind when deciding on additional features. There can be significant time and expense involved in a project like this, so my advice would be: don’t start unless you are sure [eg have already obtained permitted development approval] that you aren’t going to be ‘requested’ to take it down again by the planners. But if you are sure, then go for it; take your time getting the base and structure right and then sit back and enjoy! If I had a sawmill and pressure treatment plant on site, I would probably agree. My experience is that constructions of untreated roundwood, particularly conifers, have a comparatively short lifespan, compared to the time it takes to put them up. I agree that it seems daft to send potential building material up the chimney while shipping in a flat-pack shed from Birmingham, but the practical exigencies of the situation seem to demand that sometimes. Shame, though, I agree. Doesn’t it seem crazy to put a flat pack shed up that is made from wood that has been shipped half way round the world when you have an unlimited, free source of materials on site in your own wood. Sustainable woodland management means thinking about the whole picture. All that’s said, makes good sence! One need to remeber that not just the ‘shed’ but the whole picture of shed and wood ,should be pleasing to the eye. Recycled pallets make a good shed, fun to design build, different, and it’s much cheaper!